The latest Earth Day release from Disneynature, Monkey Kingdom is arguably the best film yet in the studio’s ongoing series of impressively photographed wildlife documentaries, striking the perfect balance between adorable animals, and emotionally affective drama of the natural world. Taking place in Sri Lanka, the film follows a troop of macaques living in the majestic ruins of an abandoned city. At the centre of their social order is a large fig tree, where King Raja rules from the top amidst the ripest fruit, followed by an exclusive clique of popular girls called the Sisters, who claim the middle branches. At the bottom of the tree is Maya, who is left to eat whatever fruit falls on the ground, becoming the underdog hero of this story. But when a newcomer named Kumar arrives, and Maya gives birth to little Kip, she faces new struggles to provide for her young son. Right from the opening scene, when the theme from The Monkees plays over adorable simian antics, the film often has a delightfully playful tone that will keep even the youngest audience members engaged in the story. But Monkey Kingdom also offers more than just cute footage, of which there is plenty, showing the social rankings and very real threats from other animals that bring genuine danger to their world. As usual, the veteran directing team of Mark Linfield and Alastair Fothergill have captured breathtaking and intimate images of the animals in their natural habitat, which are a real treat to experience on the big screen. This is also the first of the Disneynature films to show humans within the narrative, including a hilarious raid on a children’s birthday party and a stunningly captured sequence where they are forced into the city. These scenes give added heft to the themes of how the human world is encroaching upon the animal kingdom, and vice versa, holding up a powerful mirror between them. From little moments, like when the young monkeys use sleeping Maya as a literal jungle gym and an adorable sequence where they play with a stray dog, to the sweeping time-lapse photography of approaching monsoon clouds and starry night skies swirling above, the cinematography is beautiful throughout. Along with some well placed songs, the music by Harry Gregson-Williams is also quite lovely, and provides a nice counterpart to the images onscreen. Tina Fey does appealing work narrating the film, offering some moments of gentle humour, and also allowing for genuine empathy in her descriptions of Maya as a caring mother just trying to make ends meet. 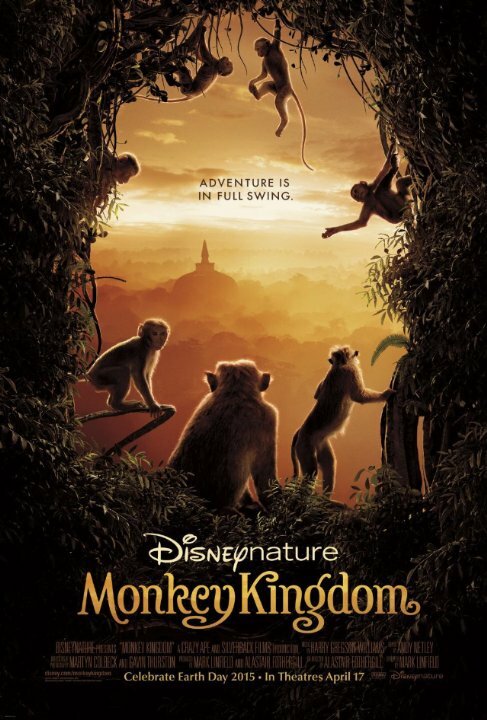 For families of every shape and size, Monkey Kingdom is an engaging and beautifully captured escape into the natural world, that provides perfect viewing for Earth Day on April 22nd.